Use the same procedure for the intake side and exhaust side. 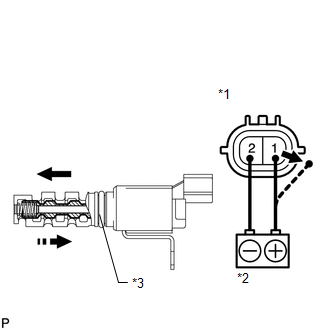 If the result is not as specified, replace the oil control valve assembly. 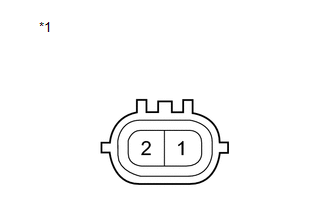 (b) Connect the positive (+) lead from a battery to terminal 1 and the negative (-) lead to terminal 2, and check the movement of the valve. Confirm that the valve moves freely and does not stick in any position. If necessary, replace the camshaft timing oil control valve assembly. Accumulation of foreign matter can cause minor pressure leaks. Minor pressure leaks will cause the camshaft to advance or retard, and this will cause a DTC to be set.